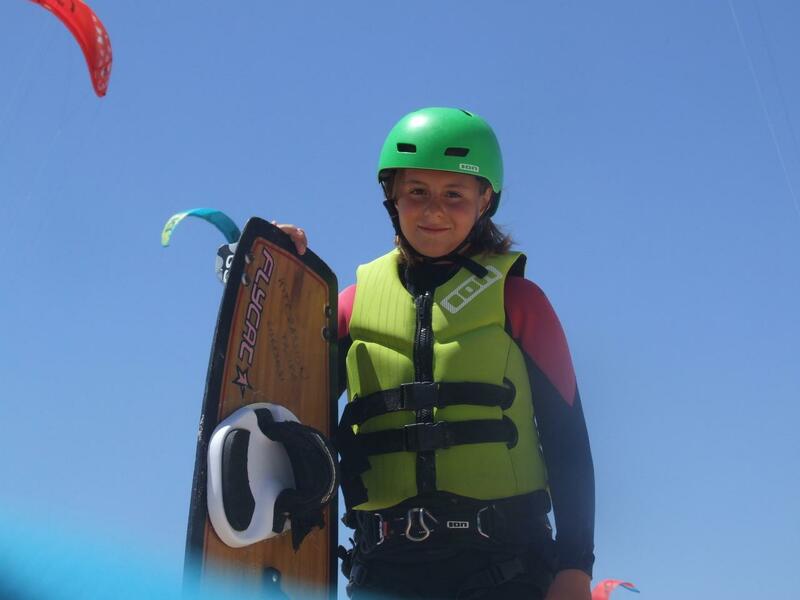 At KitePassion Tarifa Kiteschool we will advise you, from the moment you finish your kitesurfing course and get to be a totally independent rider with your IKO card (International Kiteboading Organization) certificate and you feel qualified to go on your own to make your first riding. We suggest that although you are independent, do not go alone and we offer you the opportunity to come with us to the flag. Even if you are not with us teaching, you will always know that there is watching you, that if you need a council, there will always be someone with you in the KitePassion staff. Therefore, to those who start in the exciting world of Kitesurfing we want to send you the best possible advice to avoid falling into the mistakes that some previously have made in terms of material. The first thing you should not do is buy a equipment. Wait to start discovering if it is the sport of your life and what material you need. Once the course is finished !! We are going to look for our kitesurfing gear. 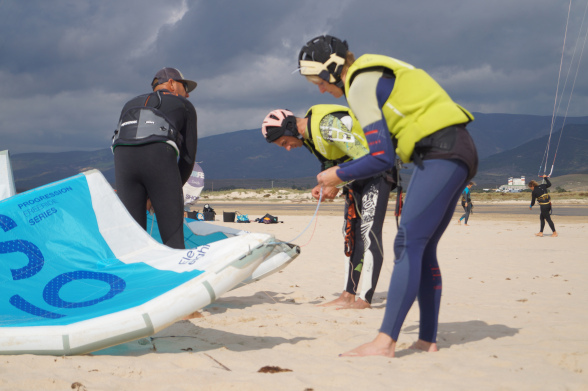 So the first advice we give you: first take a professional course with an official school such as KitePassion Tarifa, with insurances, rescue boats, IKO / FAV instructors and appropriate material of 2019. And once completed, the instructor will guide you in everything related to the material that best suits your profile and budget. To begin with, you do not need to make a large investment in the board and harness. Look for a large board with volume so that your first long and tight ones are as effective as possible. If you are a boy between 70 and 85 kilos look for a board of a minimum of 136 x 42 and a maximum of 142 x 42. Smaller of these measures will not give you that extra buoyancy and larger will be very heavy and difficult to handle. Once you reach the level necessary to start jumping, change it to a smaller one. 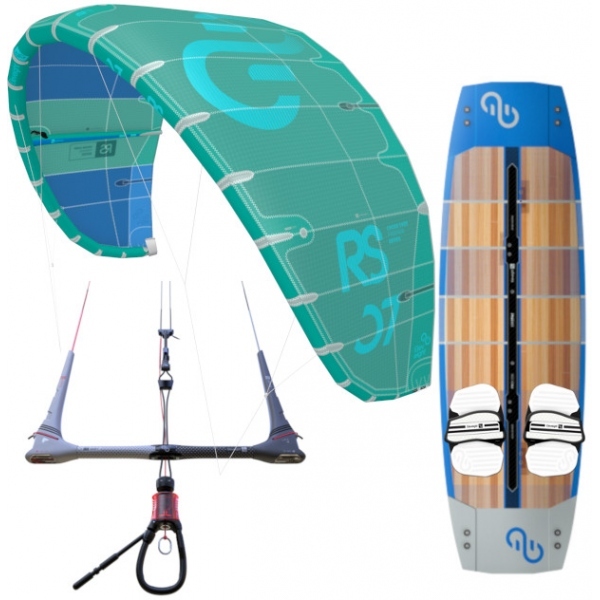 There are many brands, we recommend Eleveight Kites for its lightness and performance. The price will depend on your budget. On the other hand we find the harness, always of seat / to avoid that it rises to the chest, since at the beginning you will have a lot of time the kite in the zenith or 12 * and you will find the harness in the armpit quite uncomfortable. The seat harness will be more effective and comfortable at first. On the other hand, we find the neoprene and the kite. In this case do not skimp, as we are talking about your safety. In the case of wetsuit, try to find one as best as possible considering your budget. The water in winter and spring is cold and if you spend more time than necessary in the water we run the risk of hypothermia. For spots like Tarifa at this time of the year a minimum thickness of 4/3 is recommended. Also the thickness of the neoprene will depend on the place where you browse. There are many brands but without a doubt from Kitepassion we recommend you for its quality and durability Alder. Regarding the kite, which is obviously accompanied by your bar, we also suggest you try to look for the best possible for your evolution. A common mistake is to think of buying a first excessively cheap and old kite, since we think that we are going to hit it continuously against the ground or water. And it is true, but this old kite that already has the ripstop worn is more likely to crack or explode at its leading edge. On the other hand, but also very to take into account, is that with an older kite your safety is in danger and your learning will be slower. With the modern delta type kites hybridized by having more depower or brake capacity you will have more security and everything will be easier for you. So choose your first kite well, letting you be advised by professionals with more experience and everything will be perfect. Kite Leash: It is fundamental and it is about your security system that keeps you connected to the kite. You always have to wear it if you do not want to lose your precious comet. Accessory that usually comes with the bar. Curtains: Fundamental accessory that comes in the harness. In case of extreme situation and when the lines can be rolled to an arm or limb do not hesitate to use it and use it. Scarves: It is spots where there are rocks, many stones or cold do not hesitate to take it. They are part of your security. Helmet: The helmet is a very important element both to get rid of impacts in the hut and to avoid cuts with the lines in case you come across with another kite. Very important, although the photo does not weigh so much. Do not think that there are many things, since kitesurfing is a relatively cheap sport (the beach is still free) and if you look good there is a lot of second hand material that can serve you perfectly. You already have everything! Now it’s time to kite! We hope from KitepassionTarifa Kiteschool that this article will be very useful and as always we are 100% available.